Lyman Sheets is a pinball programmer who currently works for Stern Pinball and is responsible for the code in some of the best pinball machines ever made. He is also a top ranked pinball player which separates him from many of the people who work in the industry who don’t play much pinball or don’t play competitively. I first met him at the Fairfax Pinball open. We were both waiting to qualify on a machine in the tournament bank. We had a quick conversation about how it felt like a waiting tournament instead of a pinball tournament. He said that it was hard to wait for a while and then step up to a machine cold and try to have a great game. When I was at Pinburgh, I saw a post that the Iron Man machine there had an updated code that was not publically available. I played the machine the next morning and saw that it did have updated code. The only complaint I’ve had about the Iron Man code is that the status update does not give much useful information. In the code on the machine at Pinburgh, the status update indicated how many more shots were needed to light War Machine multiball and Whiplash multiball which is the information I have always wanted to have in the Iron Man code. Taylor and I saw Lyman later and approached him to ask about the Iron Man code and whether it was just for Pinburgh or would be released as a home ROM. He said that they were testing out the new software and if it worked without bugs, it would be released as an official update to the Iron Man software. Lyman then talked to us for a few minutes about his work on other games and his willingness to update software. Pinball manufacturers are known to release machines that have incomplete code. The importance of keeping the assembly line busy and the need to provide suppliers and customers new games seems to determine when a game is released regardless of the state of the software that controls the machine. Most recently, Stern released Star Trek with limited software loaded on the machine. There has already been at least one update to the software and a big update has been promised for a while now. The same was true with Metallica which released with relatively limited software but was dramatically improved by the recent release of updated software. Anyone who has been involved with Jersey Jack Pinball’s Wizard of Oz machine knows what it is like to have a machine that is capable of much more but needs software to reach its potential. The new software update for WOZ now has it playing like the fantastic machine people hoped it would be. After we thanked Lyman for updating the Iron Man software with exactly what players had wanted for a long time, he spoke to us about his philosophy and willingness to work on the code for games he programs. Lyman listed the games in his collection. I think he said Monster Bash, Tron, ACDC and a few others. He specifically said he wanted an Iron Man but did not want to have to pay $6,000 for one. He recognized that players and collectors pay high prices for games and that he wants his games to be as good as they can be. Lyman said that he was always open to updating the software for a game if there is a bug or if there is some way that players think can be improved. He has an advantage over other programmers because, as a tournament player, he is able to see how his machines are played by the highest level players. This allows him to make code tweaks based on what he sees during tournament play and the feedback he gets from other players. Lyman is known to do programming for games on his own time to make them as good as they can be. The most well known example of this is the software for Spiderman which was thought to be good, but was made excellent by Lyman working to improve the software in his free time. He mentioned that the drawback to doing any new code is that the release is accompanied by complaints about other games that need code updates. He said he is on pinside.com every day and sees the complaints about the games that remain unfinished. He seemed to understand that this comes from the players’ desire to have the best possible machines, but it was interesting to hear that he actively keeps up with the state of pinball through pinside.com. Lyman has a great deal of pride in his software. He said that he thought a person could have Tron, AC/DC and Metallica in a collection and that they were each different enough to stand out and make a strong collection. Before we approached him, Lyman was playing Robotron, one of my favorite video games, and looked like he was pretty good at video games too. About a month ago, I made a deal with a member of pinside.com to buy his Iron Man. 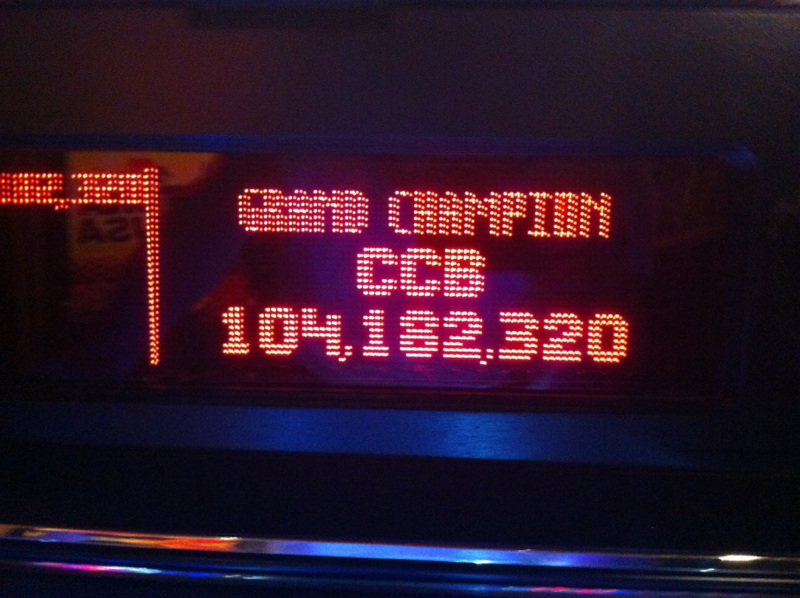 When I got it home, the GC (Grand Champion) score was 89,000,000. I changed the settings on the game to make each multiball harder to achieve. I started to feel pretty sure that I would not be able to reach the GC and would be stuck looking at the initials TAD for a while. Iron Man has average scoring of 4 to 5 million per multiball. Iron Man also has two very big scoring opportunities that are difficult to achieve. Each time you complete a mode (multiball, shield, iron man) you light one of the Mark I-VI circles. The Mark circles stay lit from ball to ball. Once you light all six, the center shot lights a mode called Jericho. Jericho is a one ball mode in which all of the multiball and mode targets are worth 250,000 to start with values increasing with each shot. There is also a reward for completion of each multiball and mode target which starts at 2,000,000 and increases. The other scoring opportunity is Do or Die. In order to light Do or Die, the player must complete all multiballs and modes in the same ball. Given the speed and difficulty of Iron Man, this is not an easy task. Do or Die is a 35 million point countdown jackpot which is collected by shooting the center shot. in the GC game, I started the third ball with War Machine and War Monger lit and about 14 million points. I hit Do or Die for 29 million and hit 49 million during Jericho.